Some students consider that living on campus doesn’t have any benefits. When they hear the word “campus,” they think about boring libraries, bad food and cramped doors. If you think so too, you’re wrong! College life on campus has a large number of perks you won’t find if you rent an apartment or live with your parents. There are multiple amenities offered on campus that you should use to boost your professional development and improve your health. Check out the list of these conveniences to keep yourself motivated while living on campus! 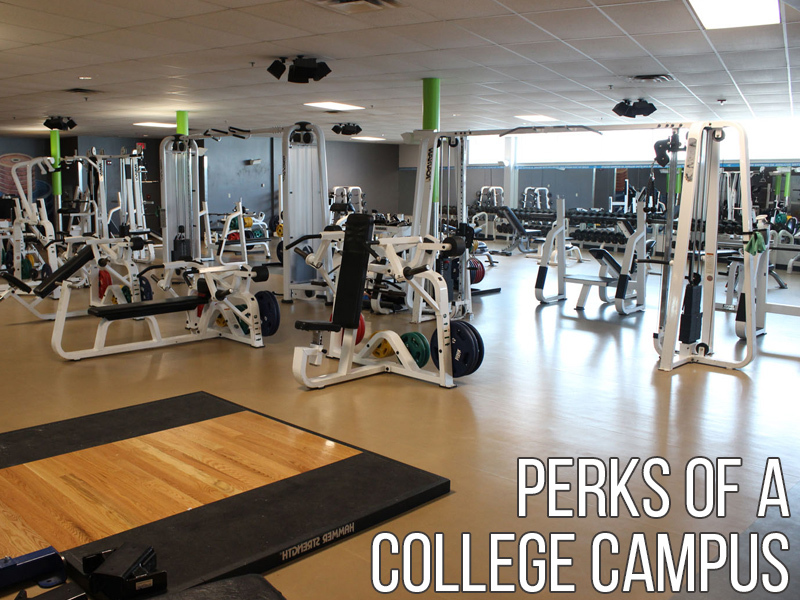 When you go to college and live on campus, a fitness center on campus is included into the fee you’re paying. Therefore, don’t hesitate to use it. Go there to run, use gym equipment, lift weights, use a swimming-pool and play sports at any convenient hours. Remember today most colleges work on improving their fitness centers. So, when you come there, most likely you won’t see a small shabby center, but a large, state-of-the-art and fully equipped gym! You may apply the counseling and health services on campus. Moreover, you should use by all means as the payment for them is included into your fee. What they offer to students is regular health check-ups, physician consultations, prescriptions, drug refills and seasonal vaccinations. Whatever issue you may have – a mental or physical one, from depression or a panic attack to a cold or a headache – you can go to your campus counseling center and consult with a professional. When you graduate, you need to write a resume and have it evaluated by a professional. If you go to someone outside of your college, it might cost you a lot of money. However, if you ask your campus career center to check it for you, it’s going to be free. So, use this advantage. Your career center staff can also assist you in completing a cover letter, arrange a mock interview with you and help you find your first workplace. One usually needs a whole fortune to hire a private tutor at any subject. If you have ever needed one during your academic career, you know that for sure. Depending on the subject you need, you could have to pay thousands per year. Living on college campus, you can have a private tutor free of charge. In the meantime, the quality of your lessons will surely be the same. Why not use this perk? Even though studying and getting a degree are the essential goals at college, there are other things you can attain there. Make sure that you take advantage of all the above-listed amenities while you’re at college.